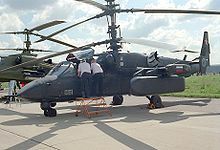 Kamov is a Russian rotor-winged aircraft manufacturing company that was founded by Nikolai Il'yich Kamov, who started building his first rotor-winged aircraft in 1929, together with N. K. Skrzhinskii. Up to the 1940s, they created more autogyros, including the A-7-3, the only armed one in the world that saw (limited) combat action. Since then, the Kamov Design Bureau (design office prefix Ka) has specialised in compact helicopters of coaxial rotor design, suitable for naval service and high-speed operations. Kamov merged with Mil and Rostvertol to form Oboronprom Corp. in 2006. The Kamov brand name was retained, though the new company dropped overlapping product lines. 25 September 1929: The first Soviet autogyro, designed by Kamov and Skrzhinskii. Based on Cierva models. Please review and edit information on this topic and it's sub-topics by an expert or better informed person. An autogyro primarily used for observation duties. An unmanned coaxial helicopter developed with Daewoo of South Korea initially designed for agricultural tasks. Performances are a max weight of 250 kg ( 50 payload ), speed of 110 km/h, and a flight duration about 45 minutes. A high-speed assault helicopter project with tandem rotors. Cancelled. A heavy attack helicopter project with a pusher: propeller to exceed the speed of 400 km/h. Not built.